The younger Johann Strauss’s eternally popular comedy gains new charm in this English-language performance. The madcap action on the outskirts of romantic Old Vienna is headed by Susanna Phillips as Rosalinde, who is determined to teach her philandering husband (Toby Spence as Eisenstein) a lesson, even while she is being pursued by her former beau, the operatic tenor Alfred (Dimitri Pittas). 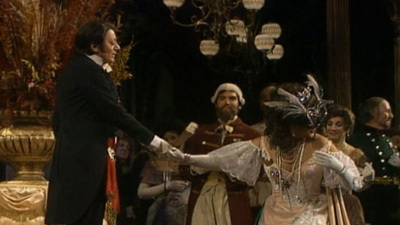 At the center of the action is Susan Graham as the extremely wealthy, eternally bored Prince Orlofsky, whose lavish masked ball brings everything to a most delicious boil. Tony Award–winner Paulo Szot is Dr. Falke, who cooked up the whole plot just to get back at his friend Eisenstein. Lucy Crowe is Rosalinde’s maid Adele. James Levine’s conducting keeps the tuneful score at its effervescent best.